Simple outfit for Wednesday as I had a lot of running around to do at work. This tee is another one of the things mum picked up for me on our shopping trip the other weekend. I love my grey tees! 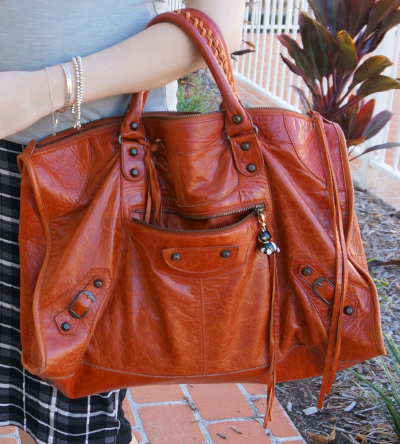 :) Added a bit of colour with my orange Balenciaga bag. It's been getting a bit ignored lately, I've been using smaller bags more often. Last worn: tartan check pencil skirt, studded mouse flats, Balenciaga rouille work bag. First time I've worn the tee as it's a recent gift. Excited to share that I was featured as February's Southern Hemisphere Style Blogger over at Tara Honeybird! Go check out my interview here. Last worn: Asos neon trim cardi, French Connection paisley print dress, two tone flats, Marco Tagliaferri bag. Linking up with Three-Fer Thursday, What I Wore to Work, Friday's Fab Favourites, Friday's Fancies, Casual Friday today. I have a zillion gray tees too...I think I like them better than my white ones. The paisley dress is so pretty. Is it maternity or regular? you have such cute maternity style! i love the paisley dress and great accessories too! Lovely post! These looks are awesome! you look so cute! love the skirt! I love that Balenciaga bag. The color is so rich and gorgeous. Pregnancy definitely suits you, you're looking lovely as always. You look so pretty!! I love gray tees so much and I think that gray looks good with anything!! I am loving your maternity style by the way! You look so cute and comfortable at the same time! Love that paisley dress! You are looking fantastic! Your bag collections is amazing! Cant wait to see what nappy bags are added to the collection!! I just adore the orange trim on the cardigan, what a great pop! i love the orange details on that cardigan, so unique and cool! awesome outfits! That dress has a lovely pattern on it! Thanks for joining the Friday's Fab Favorites link up! I'm a co-host this week and I'm trying to read every post! Again, I love seeing your doggy in the outfit pics! love that balenciaga bag!! and your doggie is so cute!!! Wow, that's so warm! We are lucky, it's calmed down here and rare to get too high over 30. Such a gorgeous bag! I hope to own a Bal bag some day. So cute and comfy. Cute outfit hun! That's a fabulous skirt and I love that second outfit! How beautiful do you look Mica!! !